My rating: 9/10. Swiss made watch. Brilliant splash of colour. Hello, today I’m doing a Hanowa SM34223AEU/H03MS review. 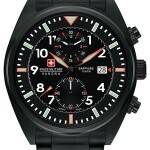 This is a rather beautiful looking Swiss made timepiece from Swiss Military Hanowa. It’s a watch that offers extremely good value for money, in my opinion, featuring a Swiss quartz movement and a sapphire crystal glass. I hope you enjoy this Hanowa SM34223AEU/H03MS review below. I really like the overall casing and dial design of this watch from Hanowa. The bezel looks awesome in my opinion, drawing your eyes in and adding an excellent splash of colour to the design. The chronograph sub dials are laid out nicely leaving plenty of room for the date display too. There’s a good use of lume on the hands and hour markers of the watch that will come in handy when you need to read it in dim lit conditions. I’m pretty impressed to see that this watch features a sapphire crystal glass. This type of glass is extremely scratch resistant with a Mohs hardness rating of 9. It’s normally found on more expensive watches so that’s why I’m very pleased to see it on this model in this price range. The watch features a very good Swiss made quartz movement. Swiss movements are often preferred for their better build quality overall. It’s accurate and reliable requiring very little in the way of maintenance. The Swiss movement is another great feature of this watch. This model has a nice large casing size with a 42mm diameter and 10mm thickness. This makes it a very popular size as these larger watch designs have become very on trend. The strap of stainless steel and has a width of 20mm and features this nice two tone brushed and polished finish. It fastens with a standard fold over style clasp that features added safety catch. On the dial, there’s a small date display with the added day of the week shown on a sub dial. An added bonus is the pretty decent 100m water resistance rating. This model has a 100m or 10 bar rating which makes it suitable for recreational surfing, swimming, snorkeling, sailing and water sports. Band Stainless steel strap, standard length, 20mm width, fold over style clasp. Case Stainless steel casing, sizing diameter: 42mm and thickness: 10mm. Dial Analogue display. Sapphire crystal glass window lens. 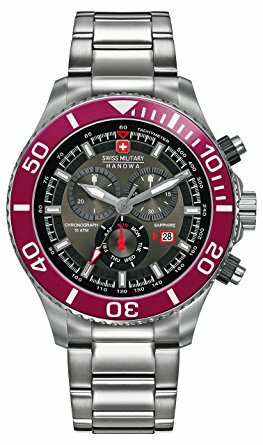 I’ve always been quite a fan of these Swiss Military Hanowa watches. 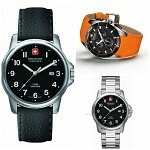 Like the Victorinox brand, I think they offer some excellent value for money as well as looking very stylish. 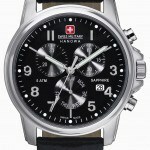 Hope you enjoyed this Hanowa watches review SM34223AEU/H03MS. Find more watch reviews below.